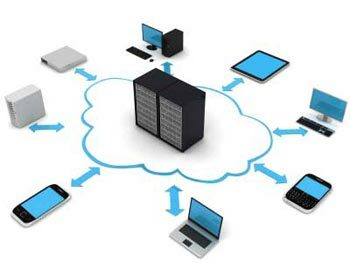 Having your email in the cloud means in its simplest form that your mail server is reachable from an Internet connection anywhere you are. The clever part comes when you have more than one device and want to keep email synchronised across all devices, that's both incoming and sent emails. This is where Microsoft's Exchange Server comes into the equation. The Exchange Server sits on the Internet and is repeatedly monitoring all your devices and when it sees a change on one device it will synchronise all the other devices so they are all holding exactly the same information. 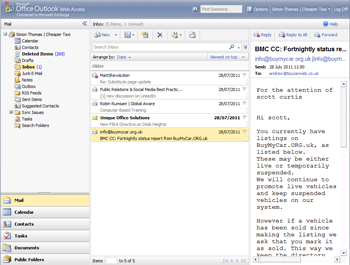 This information is not just your email, it will synchronise your address book and your diary too. Practically any modern email enabled device can link into the system including Blackberry on either BES or BIS, iPhone, Nokia and other smartphones with "Mail for Exchange" facilities, and of course PC's and Macs. With our system you can of course just log in anywhere and access remotely from a web browser. 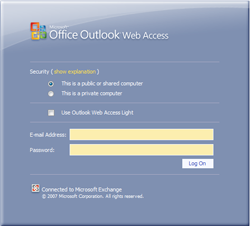 Access: Outlook Web Access, Outlook via RPC over HTTPS (Exchange), Mobile devices. When your accounts are established you will be sent the login information so you can set up your devices on the system. A generic setup document is available. We have a dedicated MS Exchange support desk that is manned from 08:00 to 20:00 GMT. If you require someone to visit your premises to set up your devices Toucan Internet LLP has trusted partners that it can recommend to do this. Just call us on 01279 871 694 and we'll be able to advise the most appropriate support company when we know your location and requirements. The system is simply costed at £11.70 per month with a £15.00 set up fee per mailbox user. If more than one mailbox user is set up at the same time then second and subsequent users set up fees are just £5.00. Billing is annually i.e. £140.40 per user per year. Toucan Internet LLP also offers a powerful and user friendly email security solution that can be added to every account. This will scan for Span and viruses in your email and quarantine Spam, sending your a daily digest by email where you simply click to release a message or whitelist a sender. More control on your preferred settings is further available from your password protected control panel.